With the rapid development of information and communication technology and increasingly intense competition with other organizations, information organizations face a pressing need to market their unique services and resources and reach their user bases in the digital age. 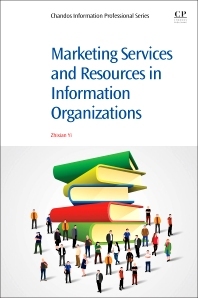 Marketing Services and Resources in Information Organizations explores a variety of important and useful topics in information organisations based on the author’s marketing courses and his empirical studies on Australian academic librarians’ perceptions of marketing services and resources. This book provides an introduction to marketing, the marketing process, and marketing concepts, research, mix and branding, and much more. Readers will learn strategic marketing planning, implementation, and evaluation, effective techniques for promoting services and resources, and effective social media and Web 2.0 tools used to promote services and resources. Marketing Services and Resources in Information Organizations is survey-based, theoretical and practical. The advanced statistical techniques used in this book distinguish the findings from other survey research products in the marketing field, and will be useful to practitioners when they consider their own marketing strategies. This book provides administrators, practitioners, instructors, and students at all levels with effective marketing techniques, approaches, and strategies as it looks at marketing from multiple perspectives. Dr. Zhixian (George) Yi is a Leadership Specialization Coordinator and Ph.D. supervisor in the School of Information Studies at Charles Sturt University, Australia. He received a doctorate in information and library sciences and a PhD minor in educational leadership from Texas Woman’s University, and he was awarded his master’s degree in information science from Southern Connecticut State University. In 2009, he was awarded the Eugene Garfield Doctoral Dissertation Fellowship from Beta Phi Mu, the International Library and Information Studies Honor Society. He was selected for inclusion into Who’s Who in America in 2010. Dr. Zhixian (George) Yi is a lecturer in the School of Information Studies (SIS) at Charles Sturt University (CSU), Australia, where he is Leadership Specialisation Coordinator. He is a Ph.D. supervisor. He mainly teaches the management and marketing subjects and conducts related research projects. He was born in group 3, Huangnidong village, Xima town, Hongjiang city (previously called Qianyang county), Hunan Province, China. After the graduation from Xima High School, he taught English in this school for two years. Then, he studied at No. 1 Qianyang Senior High School and Huaihua University, and after the graduation of this university, he taught English at this school for seven years. He obtained master’s degree in English language and literature at Central South University and taught English in the School of Foreign Languages at Guangdong University of Technology for six years. He was a lecturer and associate director of the Teaching and Research Section for English Majors in the School of Foreign Languages at Guangdong University of Technology for many years. He was an associate principal and English teacher for one year at Hepo Senior High School of Jiexi county in Jieyang city, Guangdong, China. In the United States, he received a doctorate in information and library sciences and a PhD minor in educational leadership from Texas Woman’s University, and he was awarded his master’s degree in information science from Southern Connecticut State University. In 2009, he was awarded the Eugene Garfield Doctoral Dissertation Fellowship from Beta Phi Mu, the International Library and Information Studies Honor Society. He was selected for inclusion into Who’s Who in America in 2010. He won the Chinese American Librarians Association's Jing Liao Award for the Best Research in All Media for 2014, and his research paper was selected by the journal’s (Library Management) editorial team as a Highly Commended paper in the 2017 Emerald Literati Network Awards for Excellence. Dr. Yi has a significant publication record with the articles published in 12 journals including the top-ranking journals: The Journal of Academic Librarianship; Library Management; Library and Information Research; Information Research: An International Electronic Journal; and Information & Culture: A Journal of History. He has made numerous presentations at the school, national and international levels. He has submitted both internal and external grant applications to the grant committees for review at the school, faculty and national levels and obtained internal grants including the SIS Research Fellowship (2011-2012), Faculty of Education Small Grant in 2013 and the Faculty of Arts and Education Grant Development Fund in 2016. In 2016, he got the CSU Special Studies Program award and achieved significant research outcomes. He serves on the committees at the school and international levels and currently serves on the Sheila Lai Research committee of Chinese American Librarians Association. He is the editor of the Journal of Aussie-Sino Studies and the section editor of Open Information Science. His research interests concentrate on five main areas: (1) leadership and management, (2) marketing, (3) knowledge management, (4) information technology use, and (5) information use and needs. For the detailed information on him, please visit his personal website: http://www.zhixianyi.com/.